The CFCArts Beginner Musical Theater program invites you to their upcoming production, Go Fish — The Musical! Join our kindergarten-2nd grade performers for an entertaining, musical voyage under the sea to meet some fun characters! A Tuna Fish who can’t carry a tune? A Star Fish who can’t get an acting job? A seven-legged Octopus? Join in the aquatic fun as little Tiger Shark and his unique collection of friends discover how their differences make them each special. You will also enjoy an energetic show opener by the CFCArts preschool performers, as they present Under the Sea! 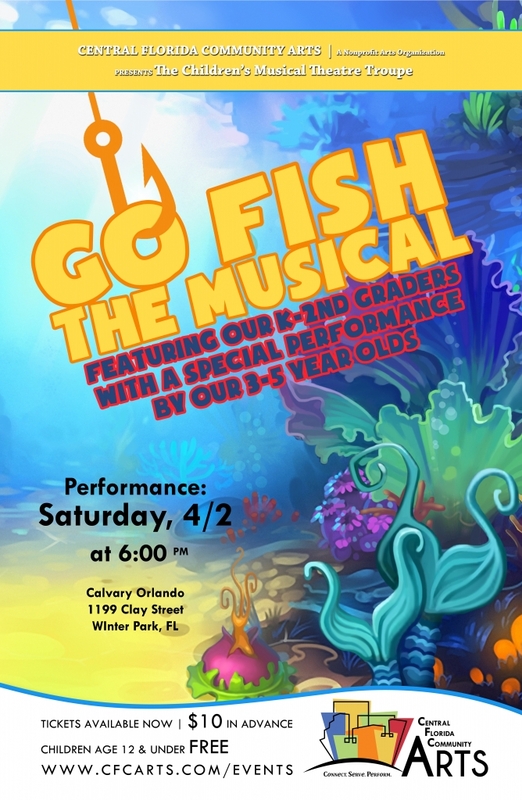 Go Fish — The Musical will be held on Saturday, April 2nd at 6:00pm at Calvary Orlando, 1199 Clay St., Winter Park, 32789. General Admission tickets are $10 and age 12 and under will be admitted for free!